You are here: Home / News / Sing! Rejoice! Celebrate! Each morning the tone of the day of work is set by prayer in common of the members of the Congregation. It is not only the delegates who appreciate it. It has been remarked that the video recording of this time of prayer is among the most highly regarded. Yes, as they had hoped and requested, the Jesuits gathered in congregation are sustained by the prayers of thousands of persons throughout the world. 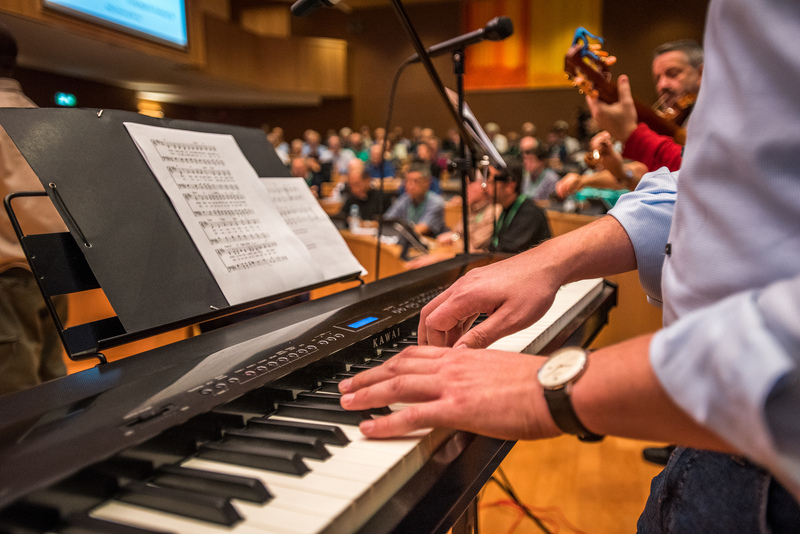 The times of prayer are coordinated and run by a German Jesuit, Clemens Blattert; he is supported on guitar by a Chilean Jesuit, José Francisco Yuraszeck, and by a violinist member of the General Congregation, Gabriel Côté, from Montreal. From time to time, other musicians bring their collaboration; whether delegates or scholastics from the Roman communities. We have asked each to present and say a few words on their liturgical and musical participation at the Congregation. CLEMENS BLATTERT, keyboard artist. Before entering into the Society, I was very much involved in liturgical music and had formation in choral direction. But, with the image I had of Jesuits (“Jesuits do not sing!”), I told myself that in choosing this order, I must cross out this part of my life. Oh well! Since the novitiate, I have been asked to prepare a booklet of songs and have been involved in liturgies. I was invited to the Congregation because I had already done this type of organization on the level of the European provinces. My task is to aid in common prayer. I insist on dialogue in prayer, between the hearing and the holding of the word. I seek to gather the thoughts and sentiments in a prayer, which directs the service: this is the Ignatian manner. I believe also in the times of silence together: it contributes to the formation of the body. I offer an occasion of mutual appreciation of cultures with songs in different languages, combining, for instance, Swahili, Hindu, or Guarani. Moreover, I truly believe that song always brings joy of heart. My participation reinforces my Jesuit vocation; I sense myself a part of the mission that we share. JOSÉ FCO. YURASZECK, guitarist. I am 39 years old and a member of the Chilean province. I have been a priest for four years and received a license in moral theology at the Gregorian, in line with the social apostolate. On returning to Chile, I had to work in this type of apostolate—under the agreement of my provincial, to be sure. Since my childhood, I have been in choirs and have participated in diverse musical activities. I learned to play the guitar very early on; I am happy that this allows me to serve during the Congregation. I think, in effect, that one should not neglect common prayer, to praise the Lord, to ask for his grace, and to seek, through prayer, to follow the ways of the Spirit. It is a privilege for me to be in the Aula every morning. I note the cultural variety and we seek to reflect this in our musical choices. But I sense that it is not easy to integrate different rhythms in accord with the languages.